← Krampus & Many Links! I could use a few elves right about now! This last month feels like I did when I was 15. Back then, simple things like walking and brushing my hair hurt me like I had carpet tacks and broken glass stuck between my joints. I’ve had Rheumatoid Arthritis so long I have a relatively high pain threshold, but what I’m experiencing lately has put me beyond my tolerance. The writing is on the wall– all fingers point to my rheumatoid arthritis remission being over. Twenty-two years with just tolerable aches and pains was a good run as far as this thief of a disease goes. 2016 will be all about breaking the relapse if I can. Blah. Or rather, blah humbug. I grew up with an old 1930’s set of My Bookhouse books by Olive Beaupre Miller. I loved those stories and beautiful lithograph illustrations. 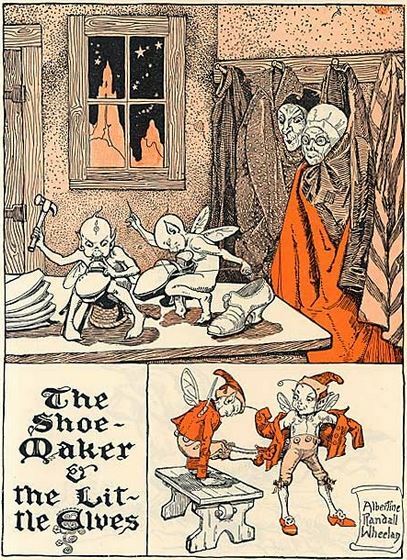 One of my favorites was a story by the Brothers Grimm — The Elves and the Shoemaker. Because elves play such a helpful role this time of year, I thought it a fitting post for an extremely busy day. I could really use an elf or two around here right now. Here’s the full translation done in 1884. Enjoy! A shoemaker, by no fault of his own, had become so poor that at last he had nothing left but leather for one pair of shoes. So in the evening, he cut out the shoes which he wished to begin to make the next morning, and as he had a good conscience, he lay down quietly in his bed, commended himself to God, and fell asleep. In the morning, after he had said his prayers, and was just going to sit down to work, the two shoes stood quite finished on his table. He was astounded, and knew not what to say to it. He took the shoes in his hands to observe them closer, and they were so neatly made that there was not one bad stitch in them, just as if they were intended as a masterpiece. Soon after, a buyer came in, and as the shoes pleased him so well, he paid more for them than was customary, and, with the money, the shoemaker was able to purchase leather for two pairs of shoes. He cut them out at night, and next morning was about to set to work with fresh courage; but he had no need to do so, for, when he got up, they were already made, and buyers also were not wanting, who gave him money enough to buy leather for four pairs of shoes. The following morning, too, he found the four pairs made; and so it went on constantly — what he cut out in the evening was finished by the morning, so that he soon had his honest independence again, and at last became a wealthy man. Now it befell that one evening not long before Christmas, when the man had been cutting out, he said to his wife, before going to bed, “What think you if we were to stay up to-night to see who it is that lends us this helping hand?” The woman liked the idea, and lighted a candle, and then they hid themselves in a corner of the room, behind some clothes which were hanging up there, and watched. When it was midnight, two pretty little naked men came, sat down by the shoemaker’s table, took all the work which was cut out before them and began to stitch, and sew, and hammer so skilfully and so quickly with their little fingers that the shoemaker could not turn away his eyes for astonishment. They did not stop until all was done, and stood finished on the table; and then they ran quickly away. *To read the fairytales and fables I enjoyed as a child with an adult eyes is a very interesting endeavor, one I recommend. It’s obvious they weren’t really written for kids. I recall toy elves being given as a premium with Joy dish soap back in the 1960s. Ugly things. lol My sister-in-law has a sizable collection of these dolls, thanks to her mother going through all that soap to acquire them for her. A few years ago, my husband found one on his gift quest and gave it to me. Did I say ugly? I have it sitting inside the Christmas tree. There’s a trend regarding those spindly-legged elves. Someone wrote a book and then a toy followed. 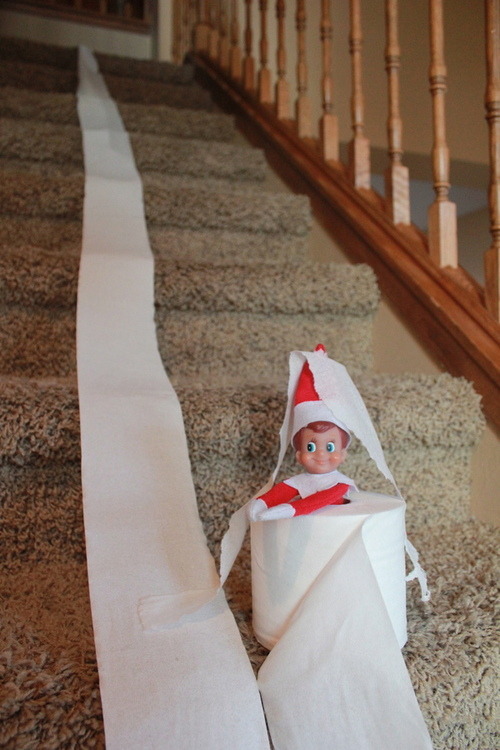 Now there’s the meme of The Elf on the Shelf. The idea is to take pictures of the elf in compromising poses. 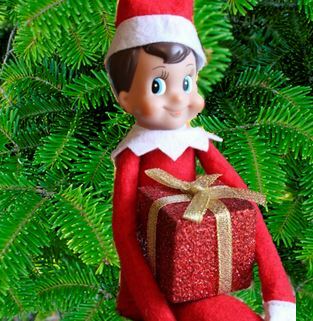 Very cute ideas for scenarios your elf gets into while you’re sleeping. My children are all grown up now, but I might have tried this. We all have interesting imaginations. That elf might have turned up anywhere. This entry was posted in Past Posts - you'll never know what you'll find and tagged Brothers Grimm, Collecting postcards, Deltiology, ephemera, holiday postcards, Madeline Archer, Romance, Rose Anderson, vintage holiday postcards. Bookmark the permalink.